Travelers tend to book their hotels near the heart of the city, such as at or near Denver’s 16th Street Mall or the Colorado Convention Center. Yet, from one to three short blocks away from the downtown bustle, travelers will discover a delightful secret and historic boutique hotel stay at the Magnolia Hotel Denver. Upon arrival, this hotel’s Old World charm is introduced by the 13-story landmark edifice, formerly the American National Bank Building built in 1910. 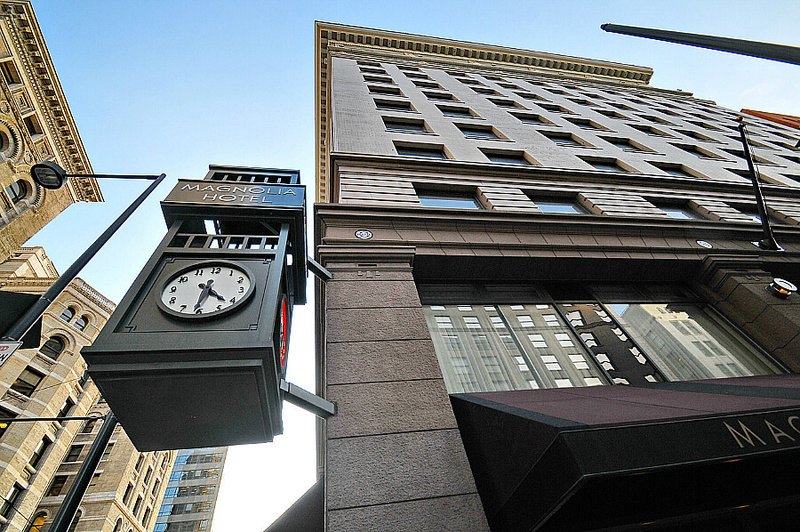 This restored building captured the historic details in its terra cotta exterior and replicated corner clock, the latter the exterior mark that you’ve found your hotel, slightly off the beaten path of downtown Denver. Magnolia Hotel Denver opened in this historic building in 1996 (3 years and $20 million investment). Earlier this month (February 2016), this Denver hotel completed yet another multi-million dollar renovation, refreshing and enhancing the guest rooms, as well as back-of-house renovations. The entrance to valet parking and the lobby is at street level and under the building. Straight ahead is one of the focal points of this hotel I’ve always loved — nooks and crannies, places to hang out and chat like this living room-like area. The reception desk is to your left. Our mid-afternoon on Friday arrival was right at check-in time, and fortunately, there was no line, with a check-in of less than 5 minutes. We walked past the living area, toward Harry’s Bar (more on that later) and snagged the elevator to our Signature Suite (bonus!). Where before the rooms were kitschy (as in fashionably stuck in the 70s), this 2016 renovation brought out the classic lines of the rooms in this historic building and added tasteful modern touches. Oversized bathrooms, flat screen TVs, executive work area, and amazingly melt-into-the-mattress comfortable beds. 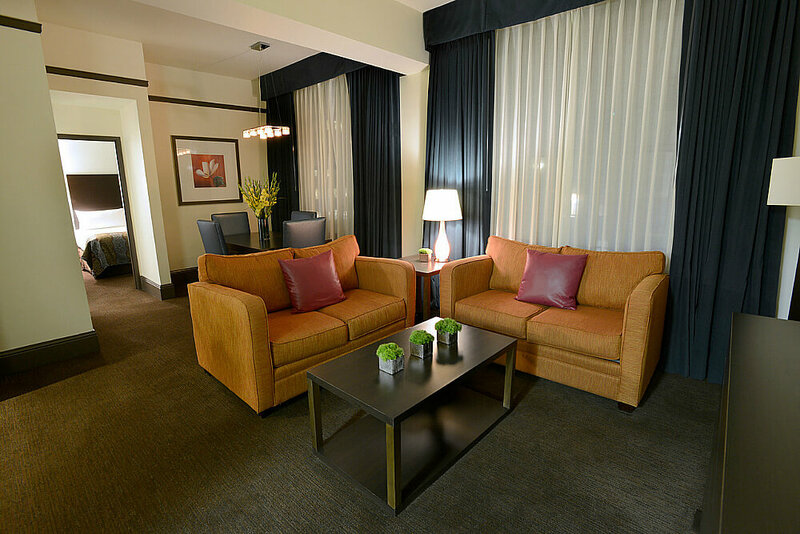 Our Signature Suite presented us with a living area to kick back, watch TV, and enjoy a glass of wine. To the right was a full kitchen and behind the living area a dining room. Fully insulated and expansive windows offered a view of downtown, sans the noise. The full bathroom was to the right of the dining room. Down a short hallway brought us to our bedroom, which included a work area (FREE WiFi! ), and a walk in closet. 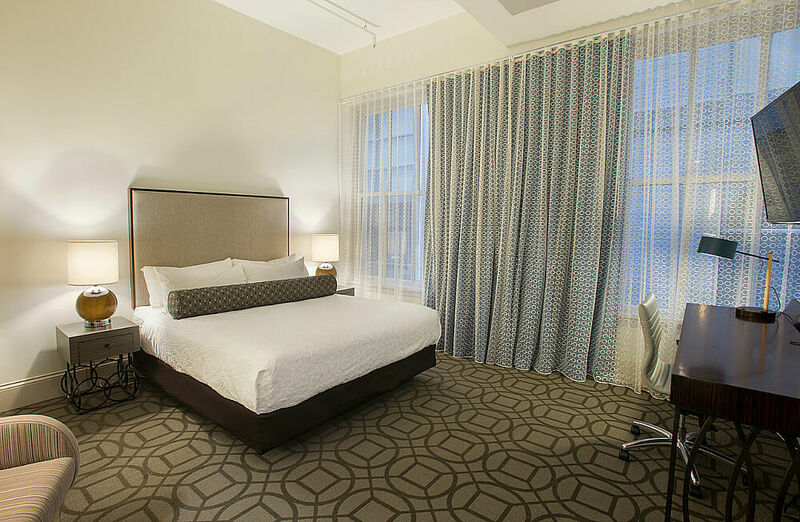 The recent renovation added 51 standard guest rooms to the inventory (splitting some existing suites) The inventory now totals 297 guest rooms and suites: a newly debuted two-bedroom Presidential suite on the 12th floor. Other configurations include a sizeable inventory of king guest rooms (196), 3 new boardroom suites, 41 rooms with 2 queen beds and 52 suites (nearly half of which have fireplaces). Another big love — so many complimentary amenities! Daily AND complimentary breakfast service included — and this is a hot breakfast, with plenty of elbow room as it’s located on the lowest level down a winding stairway. 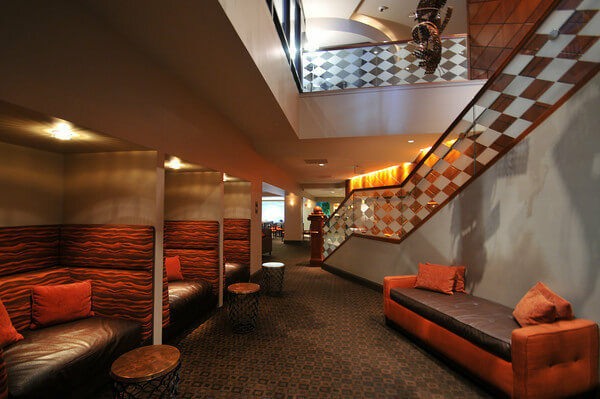 This is another area in the hotel featuring many nooks and crannies, 70s style, a pool table, and water feature, a perfect area to gather with your friends or family. Speaking of gathering in the evening, the hotel offers a complimentary evening reception for hotel guests, followed by a late evening (8-10pm) complimentary cookies and milk. My hubby and I took advantage of the downtown transportation service, again complimentary for guests. We discovered you do need to book this early, especially on the weekends as there are only so many slots available. Fortunately, many downtown Denver activities are within a 5-10 minute walk. Other notable amenities are a business center, full-time concierge desk and 24-hour fitness center. Although leisure traffic takes up the rooms on the weekend, the hotel offers more than 10,000 square feet of meeting space in its ballroom on the opposite side of 17th Street, as well as within the main hotel building. During the week, business and corporate travelers take up much of the space. 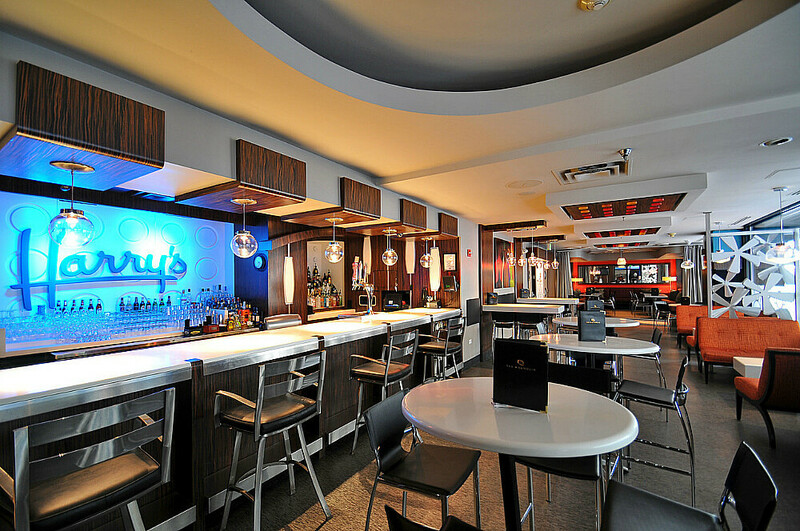 For cocktails, lunch and light dinner, Harry’s Bar is an on-site bar and restaurant, overlooking the 17th Street sidewalk. This is a great place to kick back and people watch. Here too you’ll find those nooks and crannies to gather and chat. 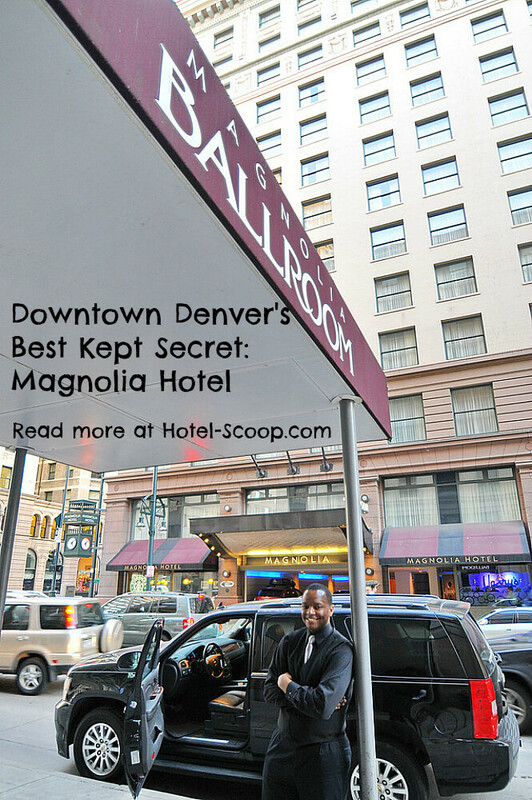 This truly is Downtown Denver’s Best Kept Secret: Magnolia Hotel. 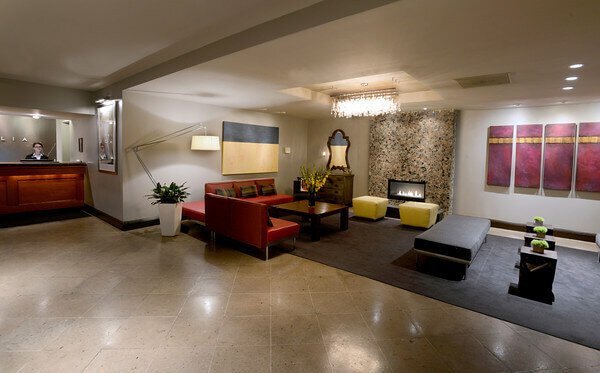 Most business travelers are well aware of the perks (daily free breakfast, evening reception and cookies), but leisure travelers often overlook this surprising affordable downtown Denver hotel. Magnolia Hotel Denver rates start at $180. Compare rates at Priceline. Accommodations provided by Magnolia Hotel Denver for purpose of a review; opinions expressed are my own. Photos Courtesy Magnolia Hotel Denver.